When in Puerto Villarta the real way to savor the best in true Mexican food and culture is signing up for one of the fantastic taco tours being given throughout the Zona Romantica/Centro area, where food trucks, stands, restaurants and points of interest in downtown Puerto Vallarta become a walk through the true tastes of this beautiful seaside community, where introductions are made to cooks and vendors who share their family recipes and provide some the the finest Mexican food you will ever eat. 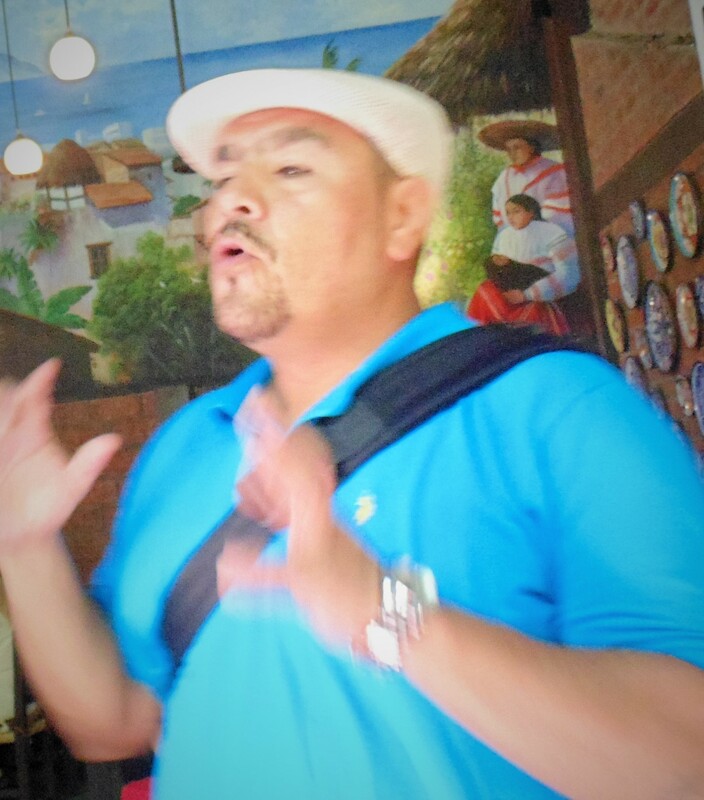 During a recent visit Roberto �Lobo� Lopez, a very talented guide and aficionado of exceptional Mexican food, took a group of travel journalists and myself on a culinary stroll through old town and downtown Puerto Vallarta neighborhoods to learn about fantastic Mexican food. The tour began with a stop at Tacos Robles, featuring the fantastic �Dorados� tacos that are deep fried in oil and served with a sipping cup of hot beef juice & onion soup that is beyond delicious. Huge crowds form a line to have a taste of Mama's specialty, and to watch her preparing the dish from Monday through Saturday 7 am � 3 pm or until they run out! Next stop Mama Rosa's sit down restaurant featuring traditional and contemporary Mexican cuisine. The entrance features an open window where patrons can view the chefs preparing food on their way into the dining area. The colorful family style restaurant features a buffet of Mexican favorites, and a variety of delicious health drinks that are a perfect compliment to their menu. The Pazole soup, a Mexican favorite made with hominy, and topped with tiny tortilla strips, paired with a lime-basil beverage was outstanding! This is a full service restaurant with a full bar. Open Tuesday � Sunday 9:30 am � 10 pm. If you are a full blown chocoholic or have a sweet tooth attack while vacationing in Puerto Vallarta you may enjoy the home-made chocolate at Xdocodiva, which is considered a world-class chocolate emporium. The chocolate truffles and molded chocolates in combination with lime, coconut, cinnamon, kahlua, guacamole, expresso and more at Xdocodiva Artisan Chocolates (established 2006) are amazing. They come in beautifully packaged gift boxes, with lolli pops and individual unique bites on view in the cases and shelves of the chic little shop. Tacos El Cuado is an open vendor truck located just off El Malecon, where hungry patrons sit on tall wooden stools to savor their freshly made tacos. This is a delightful place to enjoy a quick taco topped with some freshly made creamy guacamole and chopped onions. It's a nice local stop to eat, chat with friends and people watch before or after shopping. Open Monday � Sunday 9 am 12 am. Cesar's Coconut Stand is an amazing experience that you won't want to miss. Cesar is chopping coconut meats that he takes from a truck loaded with the wonderful freshly picked coconuts. Patrons sit on funky little plastic chairs with a front row view as Cesar skillfully pours the juice and cuts bite size pieces to sell. After removing the coconut from the husk and opening it he serves up great clear coconut juice (coconuts are kept on ice and the juice is very cold and refreshing) or a fantastic snack of fresh coconut covered with lime juice, and chili pepper that is indescribably delicious! Cesar is open Monday � Sunday 8:30 am � 7 pm. For the best ceviche you may ever taste visit Cevicheria El Guero where the chefs serve an outstanding ceviche on a tostada with fresh lime, to be accompanied by a selection of popular Puerto Vallarta hot sauce products. No doubt, this is the best I've ever tasted. They also make a Mexican beer & tomato beverage (michelada) that is served with a fresh shrimp salad on top, and is a fantastic whole lunch in cup to go! This is a really nice sit down venue with exceptioal and unique specialties. Open Monday � Sunday 10 am � 7 pm. Gaby's Mexican Restaurant is run by three generations of delightful women. The restaurant is beautiful, colorful and inviting with a patio view to the ocean, where guests enjoy live Mariachi entertainment. Gaby is said to have the best Mole dishes in Puerto Vallarta, and they were not only delicious, but also picture perfect in presentation. A Mexican Flag cocktail made for an interesting toast during lunch. This drink pairs a shot of tomato sangrite, a shot of tequila and a shot of fresh lime juice together to be sipped 1-2-3 Ole'! Gaby's is an authentic Mexican full service family restaurant. Open Monday � Sunday 11 am � 11 pm. Tuba by Concepcion is a healthful drink made by a charming man who established this elixir in 1998. The Tuba man can be found around Old Town or on the El Malecon wearing a cool white hat and standing over a strange looking orange ceramic container. His 14 year old recipe contains juice from coconut palm, walnuts, apples, sugar and two secret ingredients. You will enjoy watching a collection of characters in costume who pass you as they parade on the Malecon as you savor your tuba. Look for him Tues - Sunday 10 am � 7 pm. Next is a stop at the Orgulio Azteca Candy Store, an old Mexican Candy Factory & Store owned by candy maker Geraldo Leal, who is considered the �Willy Wonka� of Puerto Vallarta. They specialize in amazing hand-made candy and baked goods, including tequila macaroons and colorful sweet candy creations for children. Among their interesting sauce and food products visitors will find hot sauce combo packages and salsa products to take home. Geraldo and his staff are very helpful. Open Monday - Sun 9:30 am 9 pm. The Taqueria El Carboncito Taco Stand was not on our Taco Tour, but one night we happened upon what is considered by many locals and visitors to be the numero uno taco stand in Puerta Vallarta, and it was fascinating to watch the owner spin & trim the meat and then cut and flip roasted pineapple pieces to place on the tacos. At 10:30 pm this open stand was packed with people (mostly families) all enjoying the amazing tacos and selection of toppings to savor with them. This is a place of great fun and delicious authentic Mexican food at its best that I highly recommend! If you are plannig a trip to Puerto Vallarta you might like to try this fun one-of-a-kind food adventure. You will be happy to note that no one in our group had any 'revenge' issues following this tour. Vallarta Food Tours offers several different tour choices, and if you are interested contact �Lobo� at www.vallartafoodtours.com! HOTEL NEWS . . .
Sacher Group director Elisabeth Gurtler was been named "Independent Hotelier of the World' by HOTELS, the leading magazine of the worldwide hotel industry, at an exlcusive ceremony in New York. More than 90,000 readers from 160 countries select the award winners each year and only and outstanding personaltiy from the international hotel sector can win the title. 'Independent Hotelier of the World' is one of the most prestigious titles in the global hotel industry. Elibeth Gurthler is the tenth winner from Europe and the fifth woman in the world to receive the coveted award. "I see this award as an enormous compliment and a special recognition of my continued efforts to further improve the quality of the Sacher hotels. 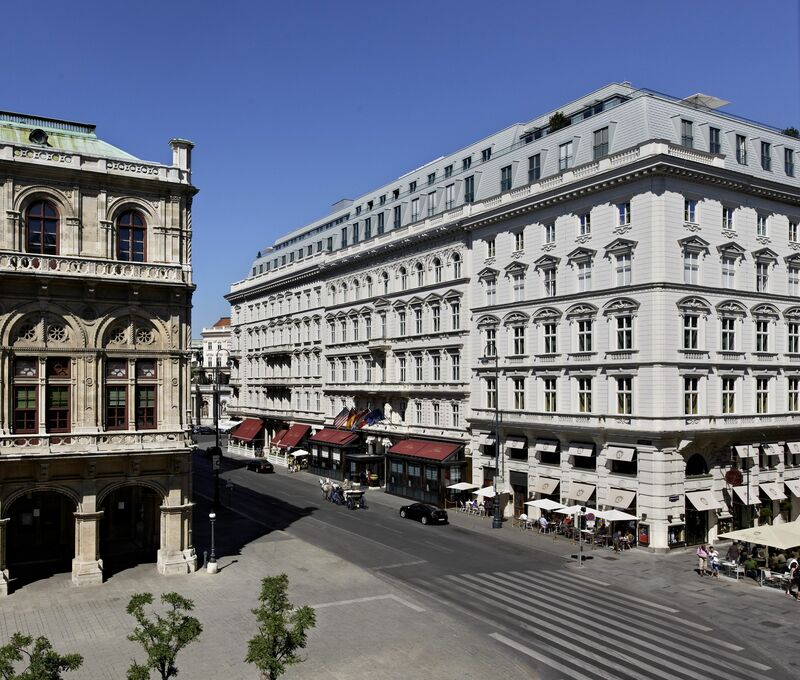 The excellent teams in both our establishments, led by Elfriede Kammerhofer at the Sacher Salzburg and Reiner Heilmann at the Sacher Vienna have contributed greatly to our success. To me this title show that my work is recognized by iternational experts," a proud Elisabeth Gurtler commented. Elisabeth Gurtler has already received several international awards for her achievements in the hotel industry; in 2010 she was presented with the Leading Legends Award by Leading Hotels in the World. Visit www.sacher.com.